Bounty Hunter metal detectors have long been many detectorists’ favorites due to their range of features that make them quite good at coin shooting, relic hunting and other similar tasks. 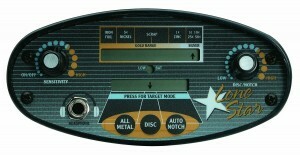 The Bounty Hunter Lone Star is an affordable mid-level metal detector, featuring not only five segments of digital target ID, but also three search modes and several levels of sensitivity. These features can make your experience more lucrative, helping you find anything from coins to relics, gold nuggets and rings. It is manufactured and sold by First Texas Products- a company that offers a diverse range of metal detectors for various uses such as relic hunting, treasure hunting, coin shooting, gold prospecting, and some custom home utility applications. First Texas Products is located in El Paso, Texas and has been in the metal detector business since 1999. The Bounty Hunter Lone Star is powered by two 9-Volt batteries and uses a waterproof 8-inch open search coil, which covers a wide area during detections. The machine has three search modes (Discrimination, Auto Notch and All-Metal), which will allow you to adjust it as desired to increase the likeliness of finding good items. Switch to Discrimination mode, and you will be able to set the machine to one of the 16 levels available, so you can successfully discriminate specific metals depending on their conductive and ferrous properties. This Bounty Hunter metal detector has 5 segments of digital target identification, which include iron foil, 5-cent nickel, scrap, 1-cent zinc and 1-cent, 10-cent, 25-cent and 50-cent silver coins. By adjusting your machine to one of these segments, you automatically discriminate the others, so your metal detector will produce audio tones only when a specific type of items has been identified. The ground balance feature of the Lone Star is automatic, which will give you no control over your machine’s reactions to specific items that come into its electromagnetic field. Though not perfectly accurate, this feature will partially prevent your metal detector from producing false signals when you detect in mineralized soils. This will automatically eliminate inconveniences caused by digging for items that appear to be located in the ground, although they are not. If you are planning to go coin shooting, relic hunting or treasure hunting on beaches or underwater, the automatic ground balance will help you identify targets as accurately as possible, thereby making your efforts lucrative and worth the time. The LCD display of the Lone Star is accurate, providing feedback on the depth of every target you come across and keeping you informed on the search mode and target ID segment you have selected. Along with the touch pad selection, this detector has an intuitive and easy-to-operate interface that can be handled by both beginners and intermediaries. This makes it versatile for any type of search, no matter how specific it is. It can be used by beginners since it works in an easy mechanism. The detector is very user friendly in such a way that any adult can read the instructions and begin to use it, although people become better with experience. You can never let it go out of your hand and stop the search for real simple treasures. There are several aspects you should be considerate towards before buying the Lone Star. One customer has commented that the quality of the touch pad buttons is rather poor, as they broke the first time he used the metal detector. Even though this is quite unlikely to happen unless you accidentally buy a product from a faulty lot, you should be careful when using this machine. Furthermore, the accuracy of this metal detector is quite disappointing, especially because of the ground balance function that is automatic and cannot be adjusted manually, thus leading you to pointless digging. The Bounty Hunter Lone Star is a good metal detector for those individuals who are just starting out, and despite its more expensive price value as compared to other mid-level machines, this one is still efficient and extremely versatile for most jobs, except for pinpointing. The Lone Star is definitely a good option to consider if you want to buy your first metal detector, or if you want to ditch your old one in a favor of a more functional machine. I used to borrow metal detectors from friends and family members when I’m going out for coin hunting and it does the job just as right. But when I got the Bounty Hunter Lone Star for my own, I couldn’t believe the improvement! It’s fun to use and pretty light. It’s very easy to operate and is a joy when you’re sweeping. And the target identification works so well in any area or surface. The downside of this metal detector though is its inability to indicate the depth of the target. Sometimes you have to dig more than usual to get to it. Rated as one of the best metal detectors for beginner and intermediary detectorists, the Bounty Hunter Lone Star has been very positively responded to by most customers who have bought it. According to one customer, this metal detector is efficient and discriminatory when set to Discrimination search mode, as he managed to successfully discriminate all pull tabs and bottle caps after adjusting the Disc/Notch knob to the 2 o’clock. Another buyer was extremely happy with how easy to use this machine is though he has never used a metal detector in the past, which allowed him to easily get familiar with the hobby and dig up 4 dimes, 6 pennies and 9 quarters during the first outings.